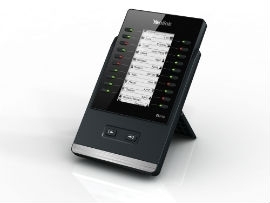 Compatible with Yealink's stylish T46GN of IP telephone, the EXP40 module has a 160x320 graphic LCD with backlight. 20 physical keys each with a dual-color LED and the ability access two page views which provides 40 additional programmable keys that can be used for speed dialing, BLF/BLA, call forward, transfer, park, pickup, etc. Supporting up to 6 expansion modules for an attendant console application, adding up to 240 additional buttons.